Remarks by H.E. 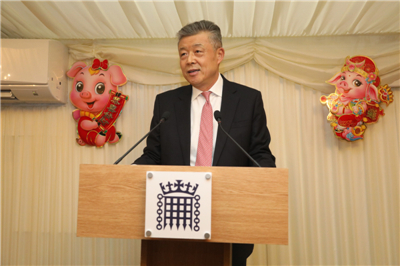 Ambassador Liu Xiaoming at the APPCG Chinese New Year Reception: Build Common Ground for a Truly "Golden Era"
Today is 23rd day of the last month of the Year of the Dog, according to Chinese lunar calendar. It is known as "Xiao Nian", or "Minor Chinese New Year". In Chinese tradition, this is the day to start preparations for the Chinese New Year. On this day, people could begin to say goodbye to the old year and start making best wishes for the new year. This is the ninth time that I have attended the APPCG Chinese New Year Reception. It is a real delight to join you on this auspicious day to celebrate the Year of the Pig. In the Chinese culture, pig symbolises happiness and good fortune. In the Year of the Pig, China will celebrate the 70th anniversary of the founding of the People's Republic; China and the UK will celebrate the 65th anniversary of the establishment of our diplomatic relationship at the level of chargé d'affaires. 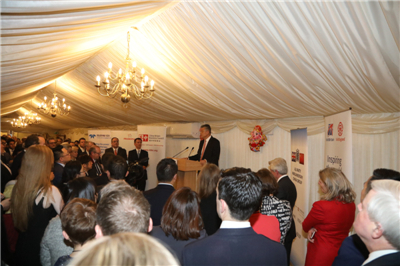 I sincerely hope that, in this special year, China-UK relations will make new progress and achieve new outcomes. In the past 65 years, despite all the twists and turns, China-UK relationship has achieved four major leaps forward. The first leap was the establishment of diplomatic relationship at the level of chargé d'affaires. This was a leap over ideological barriers. The UK recognised the People's Republic of China in January 1950, only three months after the founding of New China. It was the first major Western country to do so. Then on 17 June 1954, our two countries established diplomatic relationship at the level of chargé d'affaires. The second leap was the establishment of ambassadorial diplomatic relationship on the basis of mutual respect. This was officially announced on 13 March 1972, following UK's recognition that Taiwan is a province of the People's Republic of China. The third leap was the settlement of the Hong Kong issue, which removed the obstacles leftover from history. The return of Hong Kong to the motherland on 1 July 1997 cleared the historical obstacles to closer China-UK relations. It also set a fine example of resolving historical issues and international disputes through diplomatic negotiations. The fourth leap was the opening of the China-UK "Golden Era". This unleashed the potential of our bilateral relations for greater progress. and moved on to "comprehensive strategic partnership". In 2015, President Xi Jinping's successful state visit to the UK marked the beginning of the "Golden Era" in our bilateral relations. As long as China and the UK respect each other's core interests and major concerns, treat each other as equals and seek common grounds, China-UK relationship will make progress and develop by leaps and bounds. Otherwise, our relations would suffer setbacks, stall or even retrogress. Today, the world is undergoing profound changes unseen in a century. So is China's relationship with the rest of the world. What does this mean to China-UK relations? In face of these changes, what shall we do if we want to embrace the new opportunities, address the new challenges and deliver more benefits to our people? These are the questions that I have been thinking about quite a lot. I am sure they also feature quite often in your discussions. My answers to these questions are: take responsibility, engage in cooperation and embrace inclusiveness. First, we should hold fast to our responsibility and work for the benefits of all mankind. China and the UK are both countries with a global vision and global influence. We both support multilateralism, uphold international rules and order, and stand for improving the global governance system. And make greater contribution to world peace and prosperity. Second, we should stay committed to cooperation and work for win-win results. Both China and the UK have supported, practiced and benefited from free trade and open economy. Therefore, we have every reason to stay committed to open cooperation, safeguard open economy and oppose protectionism of all forms. When China and the UK join hands, we could make economic globalisation more open, inclusive and balanced. It is also important that we resist pressure and interruptions, refrain from creating obstacles and foster a fair, transparent and non-discriminatory business environment for companies of our two countries. On the Belt and Road Initiative, we should improve our cooperation under the principles of extensive consultation, joint contribution and shared benefits. We should work to ensure higher quality and higher standards at a higher level in BRI development. This year, China will host the second Belt and Road Forum for International Cooperation and the second International Import Expo. We welcome friends from all cross the UK to these events. Third, we should adhere to an inclusive approach and deal with differences in an objective and reasonable manner. China and the UK differ in social system, history, cultural heritage and development stage. It is natural that we do not see eye to eye on every issue. But it is important that we see each other's development as an opportunity rather than a challenge, still less a threat. We should respect each other's sovereignty, security and right to development. We should do nothing to undermine each other's core interests and weaken strategic mutual trust. I am confident that as long as our two countries treat each other with respect and on an equal footing, as long as we enhance strategic communication, deepen political trust and address differences properly, we will steer the giant ship of China-UK relations in the right direction. More than 1,000 years ago, Chinese philosopher Shi Bo said, "Harmony invigorates life while uniformity stifles vitality." For China and the UK, building the "Gold Era" is an on-going process of achieving harmony. Our jobs are far from done. Just as true gold stands the test of fire, the "Golden Era" is forged through numerous tests. In 2018, APPCG made valuable contribution to enhancing mutual understanding and deepening parliamentary cooperation between our two countries. In the new year, we look forward to working together with APPCG and people from all walks of life here in the UK. I am sure we will take China-UK parliamentary exchanges to a new level, achieve new progress in our cooperation across the board and harvest more "golden fruits" in the China-UK "Golden Era"! In conclusion, I wish everyone a happy and prosperous Year of the Pig!